Apart from Easter Eggs, the one thing that kids and the young-at-heart excite about Easter is the chocolate, especially the ones shaped like eggs. These are usually given as gifts to close friends and relatives, but do you have an idea how this practice started? Although Easter is a Christian celebration commemorating how Jesus was resurrected from the dead, the traditions surrounding the holiday are pagan in origin. In fact, the name Easter itself comes from “Eastre” (or Eostre), the Saxon goddess of spring whose feast day falls during the spring equinox. Eastre’s earthly symbol was the rabbit, also known as the symbol of fertilifiy. When the Saxons arrived in Britain during the 5thCentury, they brought along the celebration for Eastre as well. The holiday was practiced through fertility rituals that included eggs, chicks, and rabbits. Christianity eventually covered the land at around 7th and 8th Centuries and the Saxons began celebrating the death and resurrection of Jesus coincidentally with the traditional Eastre feasts. The pagan celebrations eventually toned down, but rituals for Eastre are still being practiced. For instance, eggs are used as symbolism for rebirth and have become the representation of Jesus’ resurrection. The earliest Easter eggs were painted and decorated, which is still practiced today. Meanwhile, the first chocolate eggs appeared in Germany and France. The popularity of chocolate eggs for Easter eventually spread throughout Europe and the rest of the world. We may have heard about the finest chocolates in Europe, but do you know that there are also great chocolates that are found in good ol’ USA? The popular periodical USA Today has compiled a list of 10 places across the mainland where you can have the finest chocolates you can either give to your loved ones or savor for yourself. At first glances, their chocolate may look the same thin squares of dark chocolate with squiggles on top, but each ganache has a fresh and distinct flavor. The names for each chocolate is based on the are where its ingredients were sourced, such as all-time favorites Glenn’s Raspberry (with fruits from Glenn’s Farm) and Drew Elementary School Garden Mint (with mint leaves picked from a school garden). Another best-seller is the Chocolate Figs, which were featured in The Martha Stewart Show. Call 800-747-4808. This company maintains its tradition of doing everything by hand, from the chopping to the molding. The ingredients were sourced from sustainable programs as well as from local family-owned farms. Each box of chocolates contain a particular flavor like Passion Fruit, Salted Butter Caramel, Chile Limon, and Lemon Blossoms. Contact 612-331-8800. Owned by the former pastry chef of Le Cirque, this shop is known for the limited-edition “bean to bar chocolate,” which Mr. Jacque Torres personally makes using vintage machines. His Champagne Truffles—combining milk chocolate, fresh cream, and Taittinger Brut La Francaise—are to die for. Call 212-414-2462. This artisan chocolate shop only uses fresh and natural ingredients. Confections are made in small batches. Its array of flavors is an odd mix, such as the Burnt Caramel Hazelnuts, Dark Chocolate-coated Apples, or the delicate herbs and teas found in its Signature Truffles. Can’t decide what to buy? Try out its 88-piece Platinum Collection, with all of Recchiuti’s signature flavors in one box. Call 415-834-9494. Apart from its handmade chocolates, this store prides of its Mice and Penguins, those adorable creatures made from dark, milk, or white chocolate. The mice come complete with a colorful silk tail, while the penguins are hand-piped and accented with white chocolate. 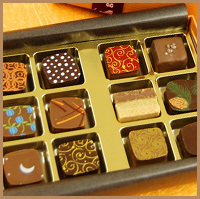 People with specific allergies or restrictions may enjoy the store’s offering of nuts-free and alcohol-free chocolates. Contact 603-756-2882. This line of artisan chocolates has intense flavors and beautiful craftsmanship. Let your eyes be amazed and your mouth be enthralled with its beautifully-decorated Seasonal Collection, with each piece containing a flavor from its current collection such as Raspberry Hibiscus, Earl Grey and Mandarin, and Dark Marzipan. Another recommended product is the Ultimate Candy Bar, a chocolate nougat with toasted hazelnuts, pistachios, and almonds, topped with caramel and covered with bittersweet chocolate. Call 401-490-2740. This shop prides of its hand-painted or airbrushed chocolate creations. It is best to treat each piece like wine, savoring it as you take in the rich bouquet of the likes of licorice, dried plum, and roasted hazelnuts, then take them in as you feel the flavors of fresh lemon, black currants, and grapefruit into your mouth. Call 239-561-7215. Donnelly’s truffles should not be missed, each containing surprising flavors like lemongrass, organic lemon, and rosemary. Its small chocolate bars, meanwhile, are handmade and wrapped in Japanese paper with flavors like cardamon, Chinese five spice, rose, and smoky spicy chipotle. Contact 888-685-1871. Assuring only the finest ingredients, Candinas recommends to consume their signature truffles as soon as possible and it shouldn’t be a problem. The truffles, covered in very thin shells, have a variety of flavors like Jasmine Green Tea, Champagne, Irish Crème, and Dark Hazelnut. Call 800-845-1554. This factory uses only local dairy products with no preservatives, additives or artificial flavors. They may only offer traditional flavors like Hazelnut, Orange, and Coffee, but these classically-made chocolates are bound to take you back to nostalgia. Best sellers include Assorted Truffles and Toffee Assortment. Contact 800-888-8742. Where to store – Place your chocolate in a cool, dry, and dark place. The storage place has to be cool enough not to soften the chocolate, but not too cold that would condensate the chocolate. Condensation dehydrates the chocolate and loses its texture and flavor. 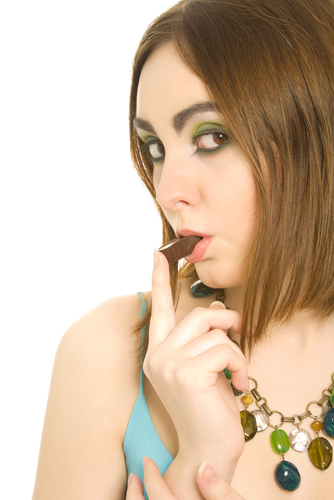 It also causes “sugar blooms,” those unsightly white or gray spots when the sugar rises on the chocolate’s surface. This is why, contrary to popular belief, chocolate should never be stored in the refrigerator. An ideal place, for instance, is the pantry down the basement. However, if you live in a hot and humid climate and you have no other choice but to store the chocolate in the fridge, make sure to place it in an airtight container. Once you take them out, let the chocolate come to room temperature before opening the container. 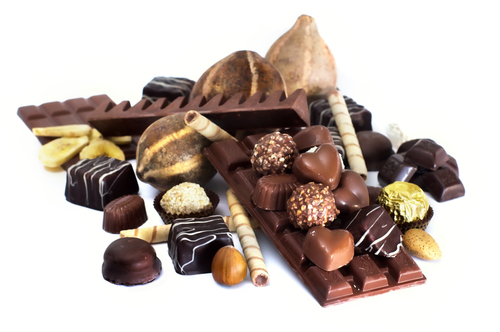 Keep it airtight – Chocolates absorb the flavors and aroma of the foods stored with it, which is why they should be kept in an airtight container. You do not want your chocolate to taste like onions or fish. Shelf life – Although fine chocolate can last for a long time, it is much advisable to eat them within a few weeks or up to a month after purchase so the best flavors and texture can still be savored. Meanwhile, properly-stored milk chocolate can last up to a year, whereas dark and unsweetened chocolate could last a bit longer. 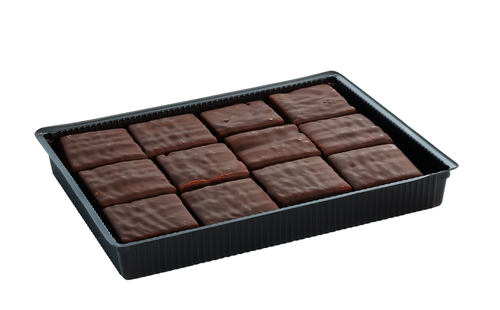 Look at the chocolate – Check each chocolate piece and esteem its appearance. 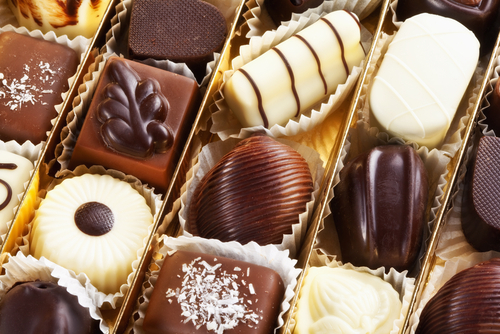 The finest of chocolates should have a consistent color and a natural-looking sheen. It should also be free of any air bubbles and other blemishes. The best chocolates should also have a high degree of craftsmanship in shape and design. Smell the chocolate – Savoring the aroma of fine chocolate begins with opening a box of these luscious treats. The bouquet of fine chocolate should have a fresh and deep aroma. It should not be overpowering or sugary, which could mean those chocolates are laced with artificial flavors or preservatives. Taste the chocolate – Chocolate lovers should look for two things once a piece of fine chocolate enters the mouth: flavor and texture. A high-quality fine chocolate should have very intense but refine flavors, an indication that these treats are freshly-made. Its texture, meanwhile, should have subtle nuances. The inside of a chocolate piece is called the filling and is specially intended to complement the flavor and texture of chocolate. Let the chocolate melt against the roof of your mouth and feel its texture. 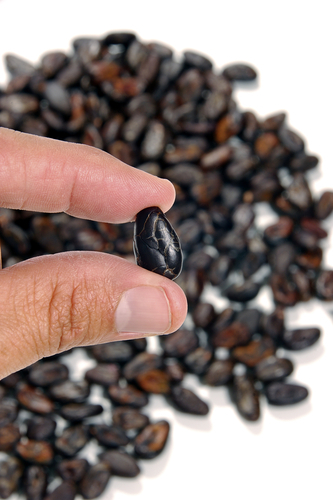 Fine chocolate should be smooth without any trace of graininess. Roll the chocolate against your tongue and allow the flavors fill your mouth. The best chocolates should have a nutty, roasted flavor at the beginning, followed by sweetness and other component flavors. The flavor should have a pleasant aftertaste that lingers on the palate.